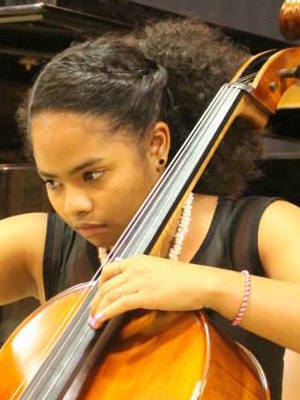 TAMARA CAMBRONERO, a sophomore at Braintree High School, has been playing the cello for five years, though she began studying the violin at the age of seven with Gwendoline Thornblade and Dubravka Sajfar Moshfegh. She is in Project STEP and NEC, and currently studies with Mark Churchill. For the past five summers, Tamara has been a student at Camp ENcore/Coda. This summer, she was a first year senior and studied with Luke Krafka. Tamara is a member of the Center for Development of Arts Leaders (CDAL) in Boston.